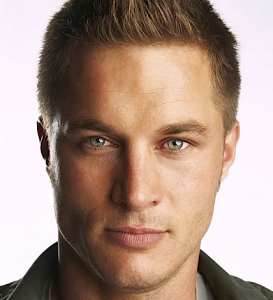 Travis Fimmel currently stars as Ragnar on History Channel’s hit original series VIKINGS. 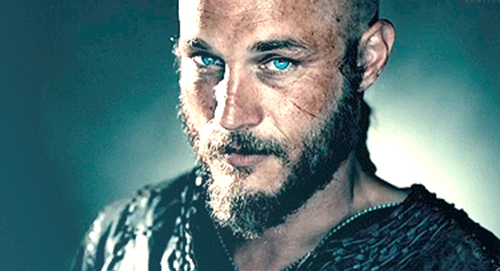 A young Viking warrior and farmer, Ragnar believes he is destined for greatness. Frustrated by the restrictive policies of his local chieftain, Earl Haraldson, played by Gabriel Byrne, he is convinced that great riches lie to the west and resolves to sail across the ocean to find them. The show premiered in March 2013 to both critical acclaim and record audience numbers. Fimmel was born July 15, 1979 in Echuca Victoria, Australia, on a dairy and beef farm located between Melbourne and Sydney along with two brothers. At age sixteen, Fimmel grew restless and moved to Sydney. By the time he turned eighteen and graduated from high school, he played Aussie Rules Football for St. Kilda, but before the season began an injury forced him to sideline those plans. He then enrolled in RMIT in Melbourne studying commercial architecture and engineering. He stayed for one year but was again growing restless and decided to join a friend who was going overseas to London. The young adventurer had planned to see some of the world and return to his home intending to enroll in university and play football again. Those plans would never materialize as Fimmel decided he wanted to become an actor. He returned to Australia for a short time and decided to move to Los Angeles. It was not long before he realized that the only way he could stay in Hollywood would be to get a modeling visa. He was found by scouts from L.A. Models in a pub in Los Angeles where they arranged housing and set up meetings. While he started booking ads for Gap and L’Oreal, it was Calvin Klein that made him world famous. His work enabled him to get a modeling visa and stay to study acting with acclaimed acting coach Ivana Chubbuck, the woman responsible for preparing Halle Berry and Elisabeth Shue for their Oscar-caliber performances. In 2003, Fimmel landed the lead role as John Clayton in the series “Tarzan” for the WB, produced by Laura Ziskin. In 2005, he starred in the WB pilot “Rocky Point” opposite Billy Campbell for executive producer John Stockwell and in 2006 starred on the FOX pilot “Southern Comfort.” In 2008, he starred opposite the late Patrick Swayze on A&E’s drama series “The Beast.” On the big screen, Fimmel played a supporting role opposite Matthew McConaughey as Johnny Doran in the Anchor Bay Entertainment film “Surfer, Dude”, a comedy about a surfer experiencing an existential crisis for director S.R. Blinder and he also had a role in the DVD release of “Restraint.” He will next be seen in Spring 2013 alongside Billy Bob Thornton in the independent feature film The Baytown Outlaws and recently wrapped the independent feature Harodim, opposite Peter Fonda. Additional independent film credits include Ivory Trade, Needle and Restraint opposite Teresa Palmer and Stephen Moyer and The Experiment with Adrien Brody and Forest Whitaker. Fimmel currently resides in Los Angeles. He will begin filming Season 2 of Vikings in Ireland later this year.